Starring Jake Gyllenhaal, Rene Russo, Zawe Ashton, Natalia Dyer, Toni Collette, Tom Sturridge, John Malkovich, Billy Magnussen, and Daveed Diggs, Velvet Buzzsaw is the latest Netflix film from writer and director Dan Gilroy, who also brought us the near-perfect Nightcrawler back in 2014. Set in the contemporary art world of modern-day Los Angeles, a group of highly regarded art collectors and critics come across a set of paintings from an unknown artist, that is attached to a supernatural force which enacts revenge on those consumed by greed. Over the last year, Netflix has proven to be one of the biggest players in the movie industry. There have been masterpieces, enjoyable flicks and the worst of the worst. Velvet Buzzsaw is in an area of its own as this is one of the only films where my feelings for it keep changing every time I think about it. 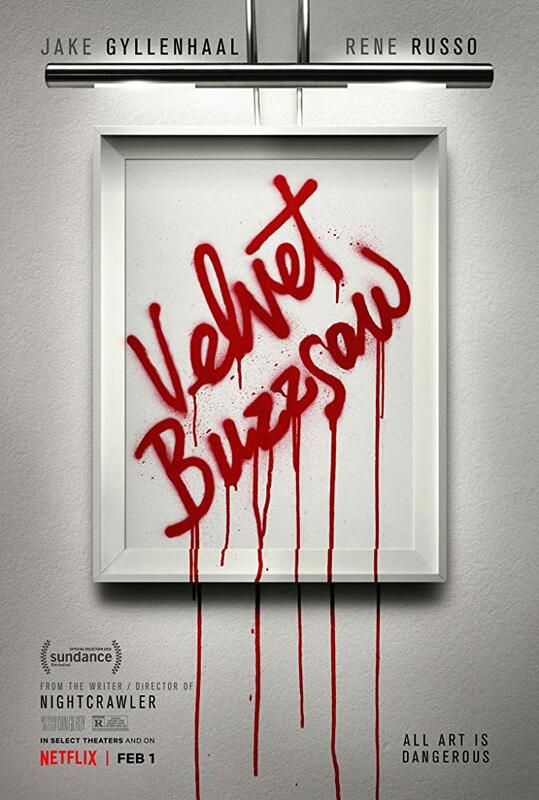 At first, I was really enjoying this B-movie style satire on modern art which slowly morphs into a horror film. Then I started to question it by wondering if it actually got finished as there are parts of this that lead to nothing and it has an anti-climactic feeling to it. I’ll start with the positives, with the first being the performances. Everyone seems to be having a blast with Velvet Buzzsaw as a majority of them are playing characters who are incredibly unlikeable and snobbish, and they’re ridiculously enjoyable to watch. Jake Gyllenhaal continues to prove himself as one of the greatest actors of this generation with a scene-stealing performance Morf Vandewalt, a critic who many consider as a god in the art world. Gyllenhaal gives a hilarious performance as this incredibly snobbish art critic who can make and break anyone with a single word. His performance is easily the best part of Velvet Buzzsaw. Rene Russo is also great as art curator Rhodora Haze, who happens to have a Velvet Buzzsaw tattoo (Is that important? Watch the movie to find out). Like Gyllenhaal, Russo appears to be having a lot of fun as one of the biggest snobs in a film full of them. She has some great moments, and her chemistry with Gyllenhaal and Zawe Ashton is fantastic. Speaking of Ashton, she is also great as Josephina, the one who comes across the mysterious art collection. Her on-screen relationship with Gyllenhaal is enjoyable, and she does have some entertaining scenes. I was surprised to see Natalia Dyer have a substantial role in Velvet Buzzsaw as Coco. The majority of you would know her as Nancy from Stranger Things, and she manages to hold her own against a cast full of veteran actors. Then there’s Toni Collette, John Malkovich, Daveed Diggs, and Tom Sturridge who all do a great job with the material given. I may have already said it, but everyone seems to be having a blast. The writing is both a positive and negative. On the positive side, Dan Gilroy has written a quirky satire on the modern art world and how we can all be easily consumed by greed. His B-movie style approach makes it feel and look wacky, and that’s works for most of it. On the negative side, it makes for a pretty uneven tone throughout, especially once the horror elements come in. I was loving the campy nature of the first twenty minutes with all of these bizarre characters interacting in this hilarious satire based world. Watching these characters communicate with each other and them basically worshipping Jake Gyllenhaal as a god was terrific. Then it turns into an average episode of American Horror Story once we get to the horror. It even feels like a pilot that never went far during the second half. I think it would’ve been better suited as a miniseries instead of a two-hour movie, as it could’ve led to more character work and it wouldn’t have the abrupt ending that is here. I’m not going to spoil anything, but it feels like there needs to be at least another twenty minutes because the final act feels rushed and anti-climactic which leads to how it could’ve been better as a miniseries. Stuff suddenly happens, and we’re left in disappointment as to what just happened. The movie is building to something crazy and then what we get is something that is made up of great things, but instead, it feels just meh. Maybe it’s just me but the second half (especially the final act) could’ve been so much better if they spent longer on it. As I said before, it feels unfinished. The cinematography is also a hit and miss. There are some incredible shots throughout (the still above with Toni Collette is *mwah*), but there are a lot of, how can I put it? Questionable decisions were definitely made in this department. Same goes for the editing, as they both show potential, but end up being average. Some shots reveal way too much, and it results in a less compelling story. The editing could’ve changed these around a bit to make it much more exciting but it doesn’t, and it’s only slightly above average. It may sound like I’m ripping into Velvet Buzzsaw and well yes, I’m ripping into certain parts of it. There may be some large negatives that affect the overall package, but this is still a really enjoyable Netflix original. Dan Gilroy does a solid job with the direction and writing, but it feels like he rushed it, and it resulted in this. I can see a modern classic here, but it needs some work. Overall, Velvet Buzzsaw is a modern art satire with a quirky and unique voice that needs to be heard. Even though it feels like an average episode of American Horror Story and the horror elements don’t work as well as they should’ve, amazing performances (Jake Gyllenhaal deserves the love for this role), a highly enjoyable first half and some fun kills make Velvet Buzzsaw a movie that needs to be seen. It may not be the Nightcrawler followup many were hoping for, but it’s solid popcorn entertainment.